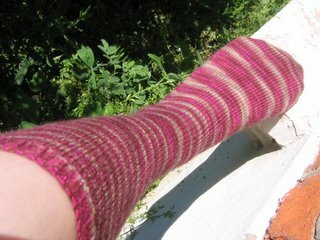 I've finished the socks for my boyfriend, but they are a present so are staying unphotographed for now. Not that he takes enough of an interest to read this, grumble grumble grumble. One of my best friends, Alexis, is about to dissapear off to LA to do a PhD. So my flatemate Kirsty and I had lots of fun setting up a treasure hunt round town for her all day on sunday. Alexis thought the three of us were going to spend the day hanging round Brixton, instead she found a big purple envelope of clues on her doorstep that moring. You can see some details of the hunt here, though that site might make more sense once Alexis and I have updated it with more photos later in the week. The picture is the last clue in the hunt, which was made by Kirsty's friend Rob and is very clever. It's a bit like illusion knitting. 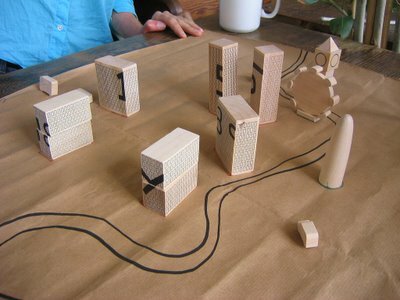 Made from a Muji London set, Alexis had to lay out the exactly pieces on the map Rob had plotted out, then place herself as if she was in South East London (where we all live). From this position odd marks Rob had made on the pieces arranged themselves into a message (the postcode for her Uncle's house, where we finished the day with dinner). 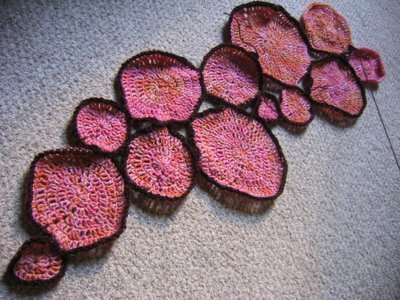 I've started adding the brown to my hipknits cashmere circles. It could do with a bit of blocking, but you can see how it is coming together. I got an email through craftster this week from a lovely lady who's made the most amazing white and red lovemeknot socks. You can see them here and here. Sarah's made a fantastic grey and black Rosalind with great tassels on the corners (wish I'd thought of that). I've seen a few beaded-icords around and even spotted someone knitting an exchequered in a photo on yarnbar. It's so exciting to see your designs worked up by other people. Despite all this I'm not really feeling design inspiration at the moment. I want to make a hooded scarf to replace one I lost last month, and figured I might as well do it now as later in the summer, then I could submit it for autumn knitty. But I don't just don't feel like it, and I hate knitting for anything other than enjoying the process. I hate knitting to order or deadline. It's partly the sunny weather. It is also because I've taken quite a bit of time off my PhD recently and have a LOT of work to catch up on. I'm also just enjoying working from other people's patterns. 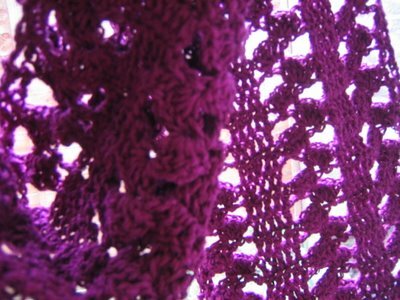 I probably will do that hoodscarf later in the summer, I will certainly miss my old one come September. If I come up with anything clever I'll put the patten up on here if no where else. EDIT: I've just seen the most recent Crochet-Me, and it's got crochet crayon's in it! I found reference to this a while back and the designer said she was thinking of submitting the pattern. 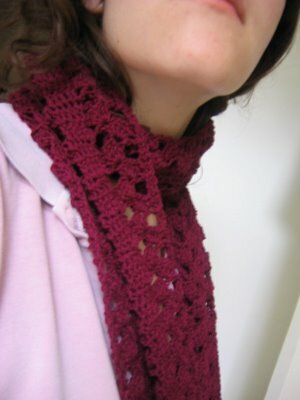 It's similar idea to my knit scarf pattern, but we both came up with the idea on our own. I love this colourway. I especially like the way the twisted bars of treble crochet show it off. I'm not a huge fan of the colour orange. Pink is lovely but can get boring. But a pink-ish orange (i.e. peach): yummy. Trust me, its prettier in person, much less "fleshy" and it glistens with silvers - the digital camera is doing that thing it does with reds. It's hipknits sockweight cashmere. I've had trouble finding the right project to showcase its gentle variegation. But I think I've found it. Inspired by some of Wormheads hats (see Lixie's WIP of one too) and, er, um, an Orange Broadband advert. 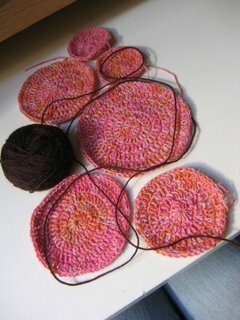 These circles will eventually be a scarf. Joined loosely together and arranged rather randomly - like bubbles. Perhaps with the addition of a bit of brown merino to keep it order and set off the russets in the colourway. But I'll see when all the circles are done. I've been using the adjustable ring method to start the circles off. It's easy and neat. Thank you so much for all the comments and emails (and, in one case, song) about my Dad. It was lovely to come back from the funeral to such a warm set of messages. Anyway, to happier things. In the same spirit I wrote my last post in (i.e. mixing knitting with the rest of life), 30 things about me, from the hipknits competition to celebrate Kerrie's birthday. 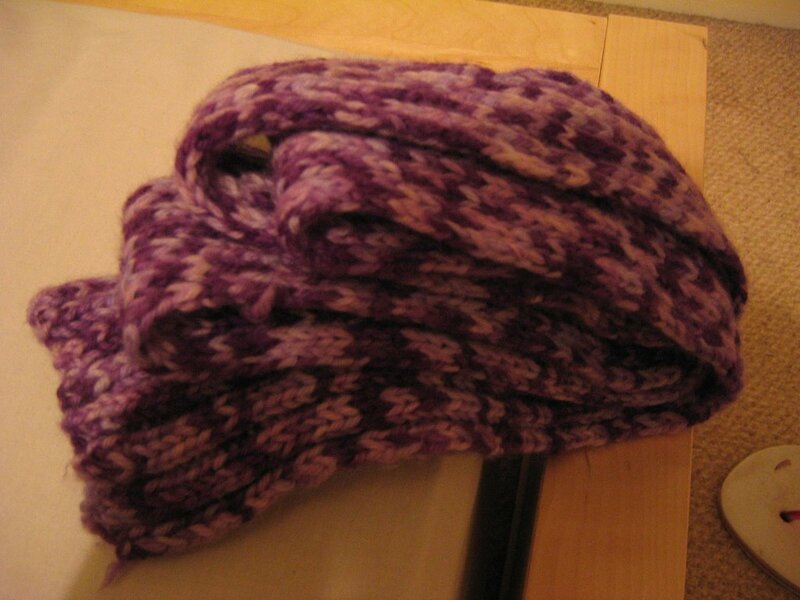 1) I've just made the scarf pictured above and at the bottom. 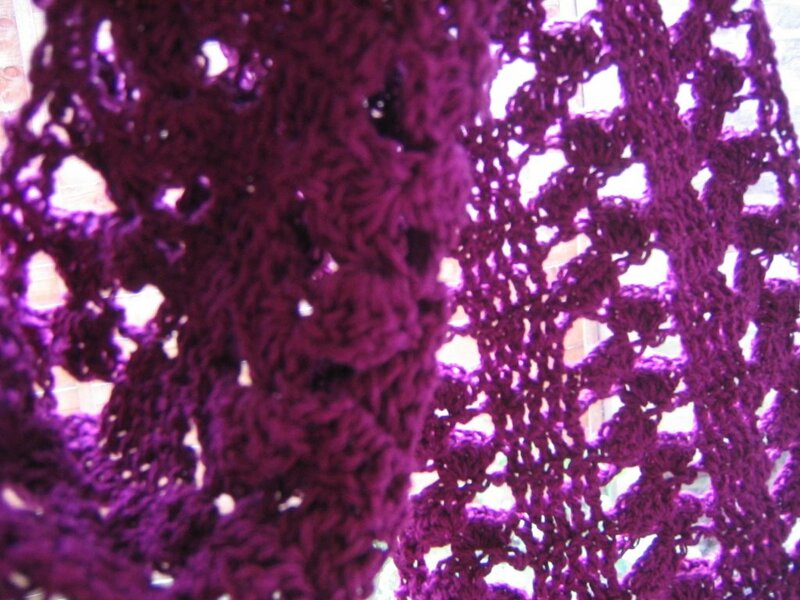 It's crochet, using a stitch pattern I found in this book. The yarn was leftover from the kiri I made recently. 2) I always say I don't like fireworks, but if I come across a display by accident I'm transfixed. 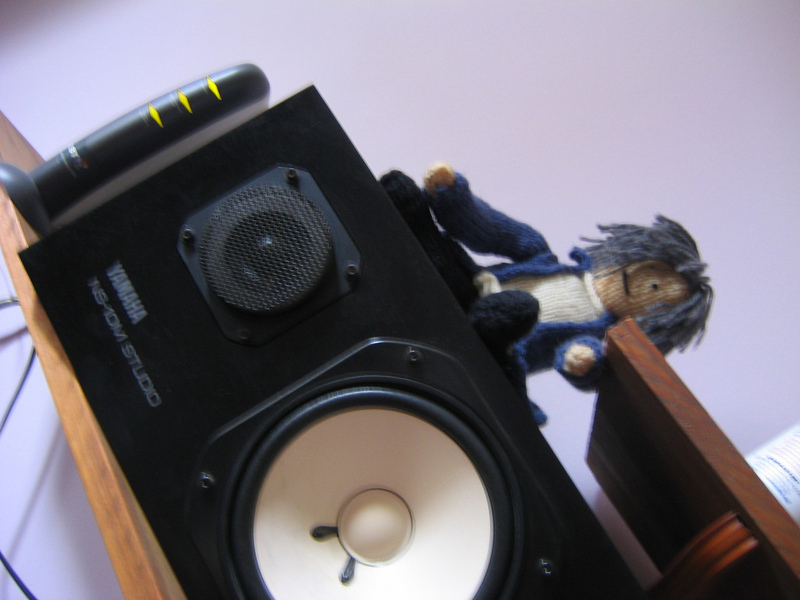 3) I listen to a lot of radio four but not a huge amount of music. 4) I have been flashed a few times. It happens. I was once flashed on the bus while I was knitting. The guy talked to me about the knitting for a bit first and I wondered if it was something about knitting that got him going. 5) This is the first thing I knitted. I was so proud. Unfortunately I dropped it down a toilet at the University of London Student Union and no matter how many times I washed it I couldn't shift the smell. 6) I prefer to work with lighter yarns. DK at the thickest. 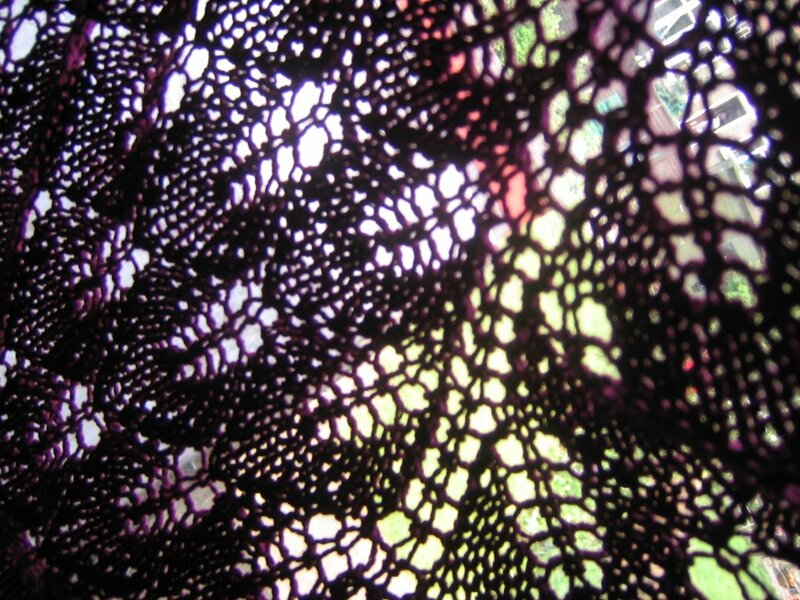 I've never actually worked with laceweight, but plan to. 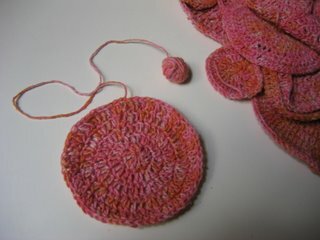 7) Actually, its more big needles I hate rather than fat yarn, but I don't mind using the larger crochet hooks. 8) I nearly went to art college, but decided to do Philosophy of Science instead. I still got to do a painting class at the Slade as part of my undergrad degree. 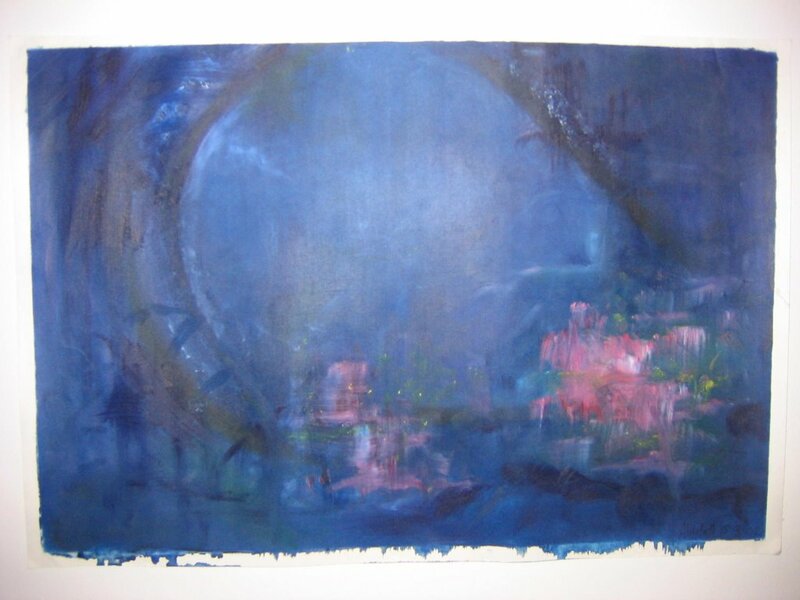 Here's a photo from it, but photos aren't the best way of sharing paintings. 9) As this picture and the choice of philosophy of science BSc might suggest, I can be pretty abstract at times. 10) I used to get paid to set fire to bubbles. 11) That was at the Science Museum. When I left my job there I realised I'd been there a quarter of my life. I think I stayed there a bit too long. 12) I co-edited a book when I was 21. You can read the online version here. 13) I helped set a world record the summer before that. Can you guess what in? 14) I once covered a bar at the Royal Albert Hall in custard and lemonade. It was a science experiment. 15) The last three points all came from the same job (not the Science Museum one). That was a good job. 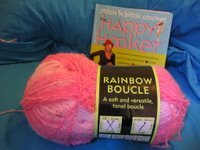 16) I really need to work out what to do with this giant ball of pink yarn in my stash (book for scale). It's boucle and really snaggy to work with. A friend bought it back from the states and wants me to make something for her with it. 17) The first time I saw my boyfriend I dropped a teacup. It still took us 6 months to get together. 18) I've been doing a PhD in kids science books since september 2004. I did the first year part time, so I'm roughly a third of the way through. 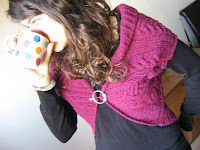 20) I constantly deconstruct knitting/ crochet garments I see (on tv, in shops, on people). I think I must scare people because they think I have an unhealthy interest in their necks, but I'm just working out the lace pattern. 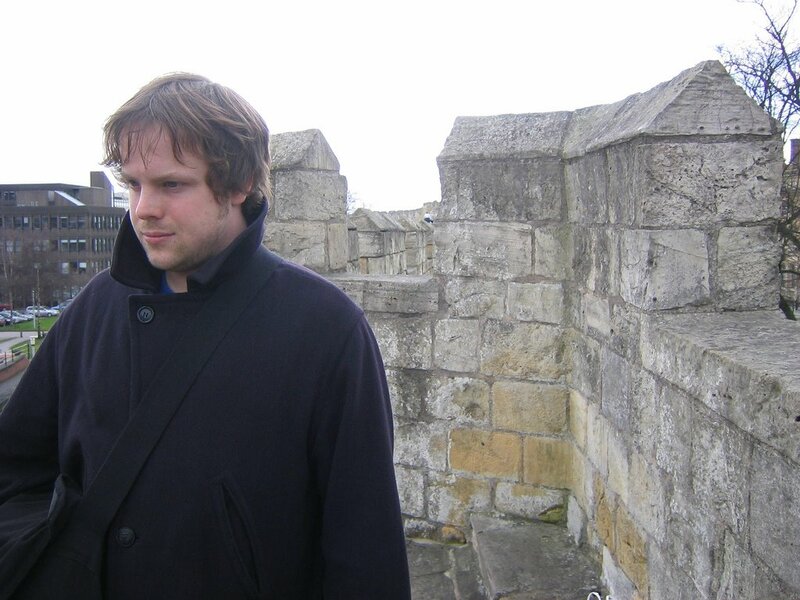 21) This is a picture of my boyfriend, Marcus, on the walls round York. He is looking really thoughtful but was probably singing a goons song in his head at the time. 22) I love going on really long walks. Through the city, a rainforest, by the beach, round parks, I don't care. I need to walk a city to get a feel for it. 23) My maternal grandmother was a great crafter. I aspire to her crochet and knitting skills. I'm planning a post of photos of some of her stuff in the next week or so. 24) I'm a terrible yarn-sniffer. This always makes me think of one of the characters in the later Lemony Snicket books, who keeps calling people "cake sniffers" as an insult. 25) I like to sniff cakes too. I really enjoy baking. My brownies are famous. Add a chopped up Mars bar, that's a good trick. 26) I have a slight problem with lactose intolerance. Which keeps the cake sniffing in check. 27) As well as yarn sniffing, I often have to stop myself from licking cables. 28) I'm dyslexic and sometimes have problems reading knitting patterns. 29) I was born in London and haven't lived anywhere else (though I have lived all over the city). 30) I have a secret desire to crochet an afghan. I'm not sure why I feel ashamed of this. It's father's day next Saturday (at least here in the UK) and there are posters up in all the shop windows. 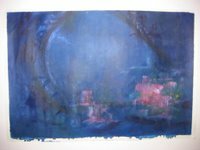 My father died last week. The morning of the 3rd June. He was only 59. I'd already started looking for jumper patterns for his 60th in December. It all happened quite quickly - a matter of weeks. He was ok at Easter, but at the start of May had lost a lot of his voice and couldn't swallow. He went to hospital and was told he had cancer of the oesophagus, liver and lungs and there was little anyone could do. I've not been blogging about it because I keep this place for knitting. But I've decided knitting can't be de-tangled from the rest of life that easily. I knit for friends and relatives, I talk about it, type about it. Although the solitary aspects of knitting have been a real help over the last few weeks, in many ways it's an very social craft, knit-blogging especially. So I'm not going to keep this major event in my life hidden from here any longer. Last year I made Dad a knitted Beethoven. A professional musician, he'd had this thing about Beethoven for years and for some reason (I could never work out why) he always dreamed of owning a bust of Beethoven. A knitted doll version seemed appropriate. I got a postcard a few weeks later from Prague, where Dad had gone to record some film music. It was from him and "Beethoven", who he'd taken with him. This year his gift was to be part of the Bakerloo project I'm doing for Magknits. He got the diagnosis just after I'd emailed Kerrie about it. So I changed materials to a soft cashmere mix and knitted super-quick so he could have it as an early Father's Day present and wear them during his last few weeks. He showed them off to everyone who visited and I think Mum's going to keep them now. He was a lovely man and my Dad. I miss him terribly. I've finished two pairs of socks recently. I've just been poo about posting about them. They were both simple toe-up st st jobbies. I worked on them while getting through a huge pile of exam marking. The purple ones above used 50g of Fyberspates in an almost solid purple (bulked out with a bit of Cygnet solid black for toes and heels). The slight verigation is lovely with hints of blue and reds along with dark, deep purples of a Ribena colour. I got it in Fyberspate's Olympics sale but I've noticed she's selling a similar colourway on Get Knitted. 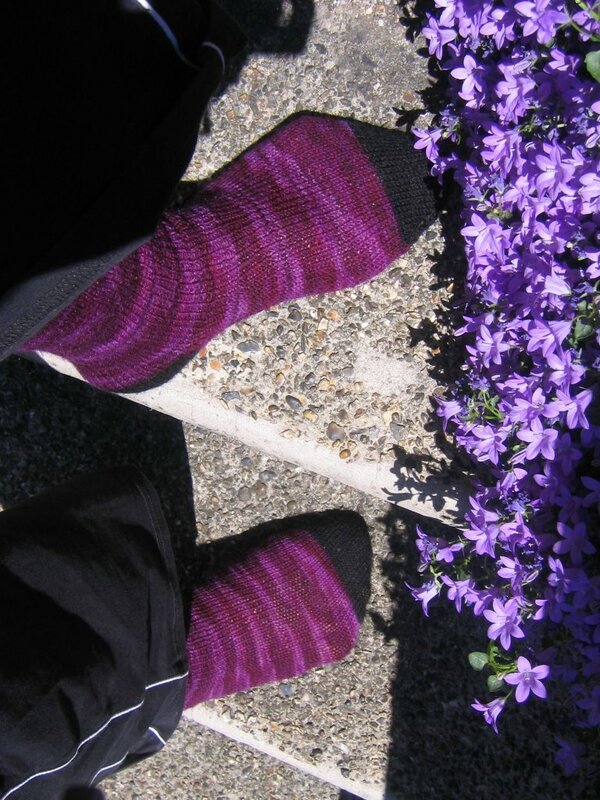 The longer socks pictured at the bottom are Lorna's Laces in Vera. I love the stripes, they make me feel all Alice in Wonderland. I think I must dye myself some proper purple and blue Alice in Wonderland socks. Were Alice's stockings purple and blue? Or was that the Cheshire Cat? Still, having Cheshire Cat legs would be fun too. In other news the lovely Sarah has corrected the written out chart for Rosalind (which, confusingly enough was first written out by a Sarah). I've corrected the version on my blog but not had time to check either versions myself. You can change the chart slighly anyway, so slight slips shouldn't make a huge amount of difference. Thank you to Sarah (and again to the first Sarah!). I was going to post about I knit a River last week but never got round to it - if you've not already seen it have a look. Described as "the best petition you'll ever knit" I knit and Wateraid are asking for knitted 15x15cm blue squares. Each blue square will be sewn together to form a "river" which will then travel to Wateraid campaigning events. All very Project Spectrum for June. There is a lovely lady called Hilary who has been a friend of my parents for years. She taught me to read a sewing pattern back when I was a little girl. 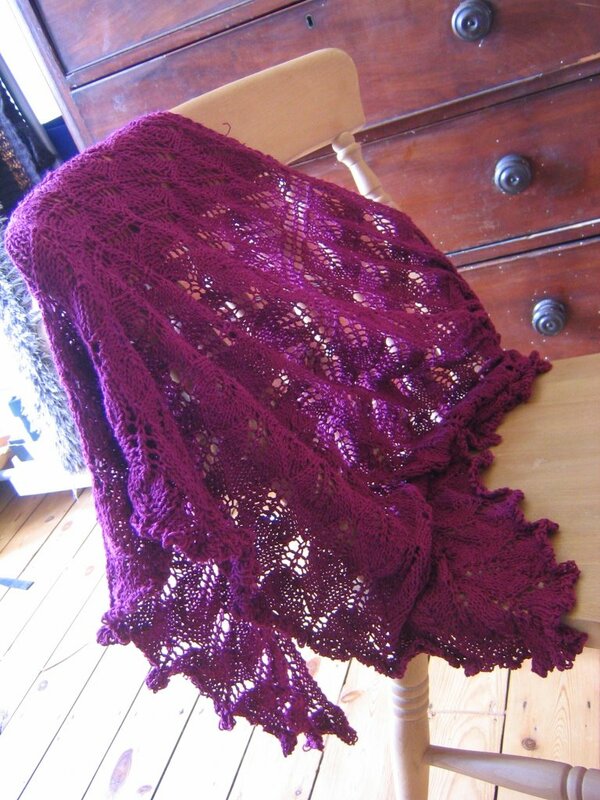 She has been especially lovely to my family the last few weeks so I made her a lace shawl to say thank you. Needles: 3.75 Addi turbo, with a 6.5mm pink glittery plastic Pony to cast off. I knew it was going to get larger as it went on, and taking 20 minutes to purl back on the final few rows wasn't the most fun way to spend a saturday night. 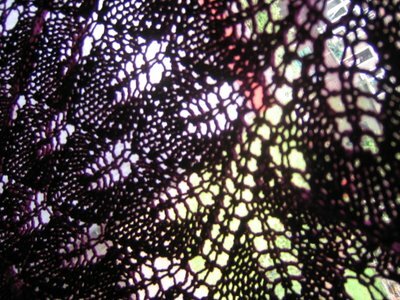 But the lace pattern's one of those very addictive ones - not so easy you go to sleep, but simple enough to hold in your head without looking back at the chart. The ruffle-like cast off is very clever, as is the whole construction. I like the ladder that runs down the middle, it makes for a very flattering line.